I just received the following Email from the National Rifle Association. President Obama and the media are waging all-out war on the Second Amendment. And unless you take action now, your right to own a gun will soon be a thing of the past. Right now Congress and the American public are being bombarded with a steady stream of media attacks on our gun rights. CBS, ABC, MSNBC and CNN are flooding the airwaves and blaming the acts of violent criminals on our Second Amendment freedom. Click here to take the NRA TAG Poll! Obama is echoing the media’s demand for “sensible gun control.” You and I know that’s code for GUN BANS and GUN OWNER REGISTRATION. 1. Do you believe that the Second Amendment guarantees law-abiding citizens the Right to Keep and Bear Arms? 2. Do you agree with NRA that no city, county or state government should have the right to outlaw private firearms ownership for law-abiding citizens? 3. Do you believe that it’s solely the responsibility of government to keep you and your family safe, and therefore, there is no need for you to ever own a firearm? 4. Do you think Congress should pass more gun control laws, or enforce the laws that are already on the books? 5. Do you agree with the Obama administration that the United Nations should be given the authority to regulate firearms trade and dictate U.S. gun policy? 6. Do you support NRA’s efforts to fight mandatory gun registration? 7. Do you agree with gun banners who believe that the names of all gun owners should be computerized and kept in a government database? 8. Do you believe law-abiding citizens like you have the right to give or sell your guns to family members without being under the thumb of the federal government? 9. Do you agree with NRA that law-abiding Americans have the right to carry a firearm for personal protection? 10. Do you support the National Rifle Association’s mission to protect the Second Amendment rights of all law-abiding Americans? Apparently, any form of gun control really means gun confiscation by the federal government. It’s a scare letter, and yes, it succeeds in scaring me — but perhaps not in exactly the way the NRA hopes. @RMM: You indicate that federal taxes do not pay for federal spending. What evidence, clear explanation can I show people that this is in fact true? It’s very frustrating that people do not understand these concepts, even when I try to explain it to them. And thanks for this website, it has been a valuable resource for my education on MMT and MS. Many people still have some quibbles with MMT and MS: They believe that the US is still monetarily non-soveriegn, and that dollars are actually silver coin and the government can run out of dollars. Educating the people is going to take time and patience. People have to want to learn and let go of their preconceived and incorrect notions. If people want to learn, then teaching them is easy. If people don’t want to learn, then teaching them is impossible. Adam Kwasman is a republican candidate for the Arizona state legislature. His campaign platform is anti-immigrant. This week the Department of Homeland Security asked the fire department of Oracle, Arizona to do a fire and safety inspection of the Sycamore Canyon Academy, a boarding school for troubled young males that was opened in 2007. At the academy, young males are given a “boot-camp”-style regimen with “tough love” – with the emphasis on love. Nearby Oracle (pop. 3,700) started as a small mining town, and today is home to semi-affluent white racist retirees, who make up two-thirds of the population, and whose median family income is $46,026. The other third is Hispanics and other groups, who tend to be low-income. Oracle is also a “bedroom community” for semi-affluent whites who work in the city of Tucson, located 20 miles away. When the DHS asked the local fire department to inspect the boys’ ranch, the fire department alerted the local racists, who assumed that buses full of migrant children were headed their way. Suddenly there was a war whoop somewhere in the crowd. A yellow school bus full of migrant kids was headed their way! Adam Kwasman went out to meet the bus, intending to bravely stop it from reaching the boys’ ranch. However the bus swerved around him and continued on. Still, it did not take the turn-off toward the Sycamore Canyon Academy. Instead, the bus continued on down the highway. The bus was not carrying migrants. It was full of kids from a YMCA who were on a camping trip. And instead of fear in their eyes, they were laughing at Adam Kwasman, and taking photos of him with their cell phones. 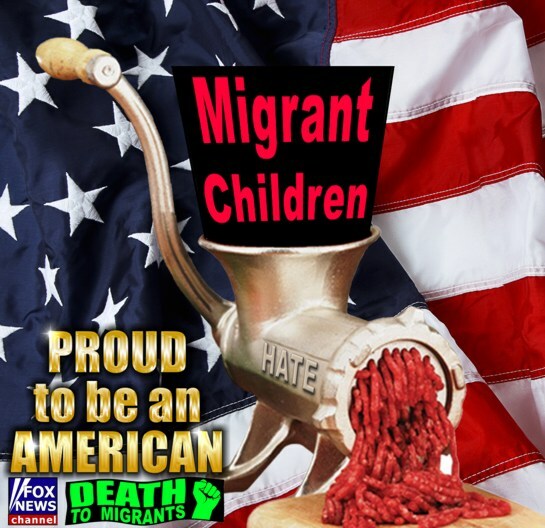 The rumored buses full of migrant children never came at all. A perfect article: Read the whole thing including the paragraph on the 2nd page.